团长：Hello. We are Linked Horizon. 团长：About last year’s concert being cancelled. 团长：The tour is not completed until we all dedicated our heart. It’s your turn to do so as well. 团长：So let’s enjoy this night as much as we can. 团长：Let’s introduce the interpretor, Germaine, to take on from here. 团长：Thank you. Sit down please. 团长：Do you know Kami no Miwaza? 团长：Thank you. Please sit down. 🕶：Raise your hand up into the sky! 🕶：Again raise your hand up in the air! 团长（走到边上喝了口水再回来）：那么那么，OK。Please listen to this song. 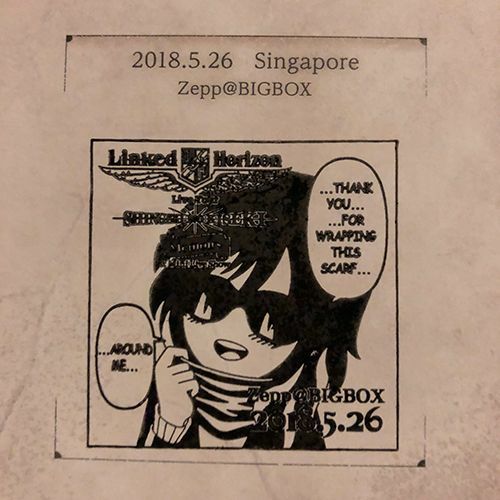 团长：The Singapore Branch of Linked Horizon Corps, DEDICATE YOUR HEART! !